Stavropol Territory, administrative territory (Russian kray) of Russia, located in the southwestern part of the country, north of the Caucasus Mountains. It is bordered by Krasnodar Territory on the west, the republic of Dagestan on the east, and by Georgia and the republics of Chechnya, Ingushetia, Alania (North Ossetia), and Kabardino-Balkaria on the south. Stavropol Territory includes the republic of Karachay-Cherkessia. The territory covers a total area of about 80,600 sq. km (about 31,120 sq. mi.). The terrain rises from the Kuma-Terek lowlands in the north, through the Stavropol upland, to the foothills and the high mountains of the Caucasus in the south. 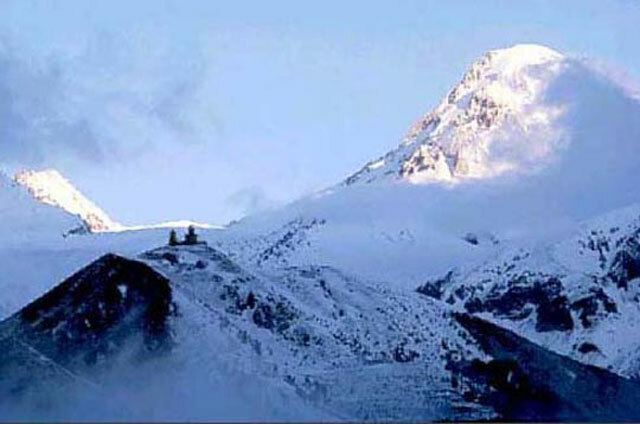 Elbrus (5642 m/18,510 ft), located on the border with Georgia and the republic of Kabardino-Balkaria, is the highest mountain in Europe. The main rivers in the territory are the Kuban, the Kuma, the Teberda, and the Ulakhan-Botuobuya. Some of the largest lakes are Lake Solenoe, Lake Tambukan, and Lake Manych-Gudilo. Steppe vegetation, such as grassland, which covers much of the lowland areas, gives way to forests in the mountains. At the time of the 1989 census, the population of Stavropol Territory was 2,825,349. More than three-quarters of the people are Russians. The population also includes Armenians, Karachay, and other ethnic groups. About 50 percent of the people live in urban areas. Stavropol' (population, 1992 estimate, 331,800), is the administrative center. Other important cities include Pyatigorsk, Nevinnomyssk, Kislovodsk, Min-Vody and Cherkessk. Some of the territory's cities are known for their mineral baths. The territory has rich agricultural land and farmers grow a variety of grains and vegetables. Sheep raising is also important. Industrial activity ranges from machine building and metalworking to food processing and textile manufacturing. Major railroads and roads pass through the territory, and several cities are linked by air. Stavropol' Territory and the other Russian territories are second-order administrative units. They have some autonomy within the Russian Federation, although a lesser degree of self-government than the Russian republics. Stavropol is administered by an administrative head and an elected legislative council. The territory has six seats in the Russian Federal Assembly: two in the Council of the Federation (upper house) and four in the State Duma (lower house). The two representatives to the Council of the Federation are the territory's administrative head and the chairperson of the legislative council. The seats in the State Duma correspond to four electoral districts; a representative is selected from each district. Stavropol' was founded in 1777 as one of a series of fortresses to protect the southern Russian frontier. In 1822 the city became the center of the North Caucasus Territory. In the aftermath of the Russian Revolution of 1917, pro-Soviet and anti-Soviet forces fought for control of the region. Soviet authority was established in February 1920 and the region was first established as an administrative unit, called Southeastern Oblast, in 1924. The name was changed to North Caucasian Territory that same year and later to Ordzhonikidze Territory. The Germans occupied the area during World War II between 1942 and 1943. The region became Stavropol Territory in 1943.